Capetonians love their city and they take every opportunity to enjoy the outdoor adventures that surround it. Running south from Table Mountain to the Cape of Good Hope, the Cape Peninsula is a favourite local day-trip destination; on weekends paragliders fleck the skies around the serrated peak of Lion’s Head mountain and surfers head south to False Bay’s balmy waters. Likewise, visitors need not slip into the “Cape coma” – the lethargy that notoriously overcomes travellers who come for a few days and,cydia apps seduced by the city’s laidback vibe and vibrant nightlife, stay for weeks. It is easy to make the most of the surrounding mountains and coastline when most outdoor activities can all be tried within an hour’s drive of central Cape Town – and many of the walking trails and beaches can even be reached by taxi or bike. From downtown Cape Town, cable cars ascend the hulking mass of Table Mountain, which looms above the city and sometimes disappears into the cloud covering, known locally as the tablecloth. Numerous trails climb the 1,000m-high plateau but the most popular is Platteklip Gorge, a steep, 3km walk that begins near the lower cable-car station. On weekends, a diverse cross-section of Capetonians manoeuvre their way between the boulders lining the trail, including groups of students in scarily inappropriate footwear. Trails criss-cross the table top offering views of the city, Table Bay and the peaks of Table Mountain National Park beyond. Visitors can also climb from the 36-hectare Kirstenbosch Botanical Gardens on the mountain’s eastern side, one of the world’s most beautiful with 7,000 plant species including indigenous Cape flora and South Africa’s signature Protea flower. 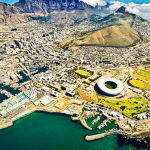 For a longer look at the mountain – proclaimed this year as one of the New Seven Wonders of Nature by the Zurich-based New7Wonders Foundation, the five-day, 75km Hoerikwaggo Trail leads through Table Mountain National Park and down the peninsula to the Cape of Good Hope at its southwestern tip. Hoerikwaggo, the nomadic Khoi people’s name for the famous formation, means “mountain in the sea” – an excellent description of the sturdy mass surrounded by shimmering bays and beaches. Table Mountain’s neighbouring peaks may not be as instantly recognisable, but they offer just as many options for breathing some fresh African air. 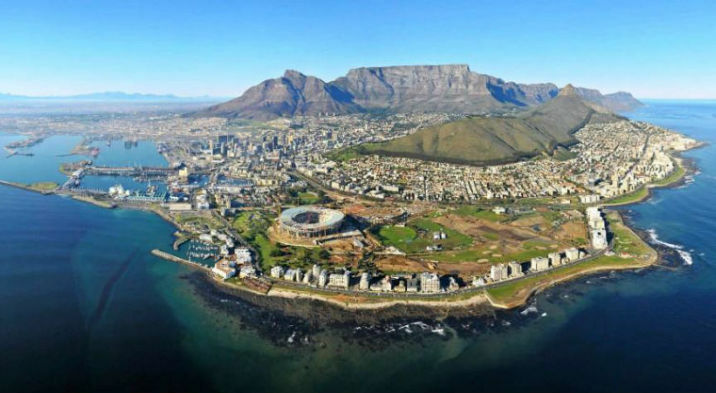 The most distinctive is the jagged tooth-like 669m-high Lion’s Head, which rises northwest of Table Mountain between the city centre and the Atlantic-facing suburbs of Clifton and Camps Bay. At full moon, locals ritually walk up Lion’s Head for sunset, finding their way back down by moonlight and torch beam. Starting from Kloof Nek — the pass between Table Mountain and Lion’s Head — the 10km return Pipe Track is a gorgeous contour path that follows the Atlantic coast towards the dramatic peaks of the Twelve Apostles mountains. Another scenic stroll leads 2.5km northeast from Lion’s Head along the ridge of the 350m-high Signal Hill, also known as the Lion’s Rump. The two adjoining hills resemble a lion sphinx, and the rocks in the sea below are even known as the Lion’s Paws. En route, a pretty green-and-white karamat (a Muslim saint’s tomb) overlooks the Bo-Kaap neighbourhood, the traditional home of the Islamic Cape Malay people. An atmospheric 1km city walk climbs past the Bo-Kaap’s colourful facades and cobbled lanes to the Noon Gun. This cannon on the lower slopes of Signal Hill is still fired at noon Monday to Saturday, continuing a 200-year-old tradition begun by the British in 1806, initially to announce the arrival of ships to people living inland, and later as a time signal, allowing ships to check their navigational equipment and Capetonians to set their watches.